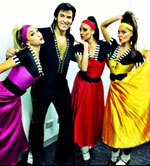 Australian Elvis Imperssonators and Elvis Tribute Shows. My show is designed to pay homage to this legend and to leave an everlasting memory for the audience. With energy and vitality throughout and interaction with the audience. A master showman. Master Entertainer. Always in demand, buzzing with excitement, his showmanship skills are fantastic and he interacts brilliantly with his audiences, creating an unforgettable night of entertainment. His vocal ability to impersonate Elvis and captivate an audience is simply amazing, as is his enthusiasm and professionalism. 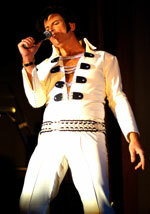 Many Elvis Tribute Artists claim to be the best, but there are very few in Australia that have the proof to back it up. 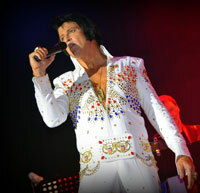 This show is one of Australia’s top award winning Elvis Presley Tribute Acts. His rapid rise over 6 years to the elite level is no surprise to those who have had the pleasure of witnessing this act. The absolute total dedication to entertaining a crowd and the remarkable connection with the audience is sometimes on a level that cannot be described. It is this dedication that has made this entertaining full time act sought after for cruise ships, casinos, weddings and for large corporate events throughout Australia and abroad. An exciting entertainer and a grand showman on all levels, with a great sense of humour and most importantly a voice that captures a great likeness to Elvis Presley. So if you’re after a confident and experienced Elvis Tribute Act and a first class showman with an outstanding Elvis voice, and most of all a very convincing Elvis look, then this is the act for your function. This Elvis Tribute Act act offers packages for larger corporate shows complete with live band, Vegas dancers, all sound and lighting or it can be tailored for smaller venues and private functions with a selection of either a live band or the option of using professional backing tracks.